The new Vesturport play, FAUST, directed by Gisli Örn Gardarsson had it’s UK premiere at the Young Vic Theater in London on the 1. October 2010. The show will be running until 30. October 2010. Young Vic Theater is recognized as one of the major theatres in the U.K. in which young directors can develop and practise their art. 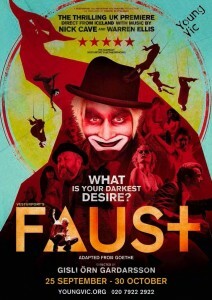 FAUST is one of the 40th anniversary shows at the Young Vic. FAUST was originally premiered at the Reykjavik City Theater in January 2010. It has gotten great reviews from critics and has been played to a full house for the whole run in Iceland.